Creativity comes in many forms, some purely decorative and some for function. I love lamps and feel they can finish a room just as jewelry completes an outfit. Lamps can be fun, trendy, creative, or timeless and classic. 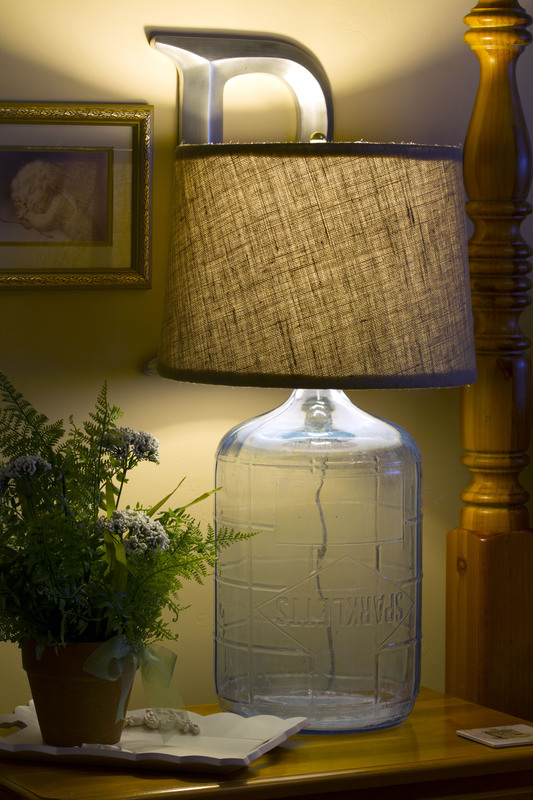 Whether store-bought or hand-made a lamp can be a statement in your home. I found this large glass water bottle at a yard sale for $3.00 and knew immediately it would become a lamp. The shade was $5.00 at a thrift store and only needed to be recovered with burlap. The water bottle had the original cork so all that was needed was a bottle lamp kit from home improvement store, the kind that has different sized rubber corks in case your bottle does not have a cork. 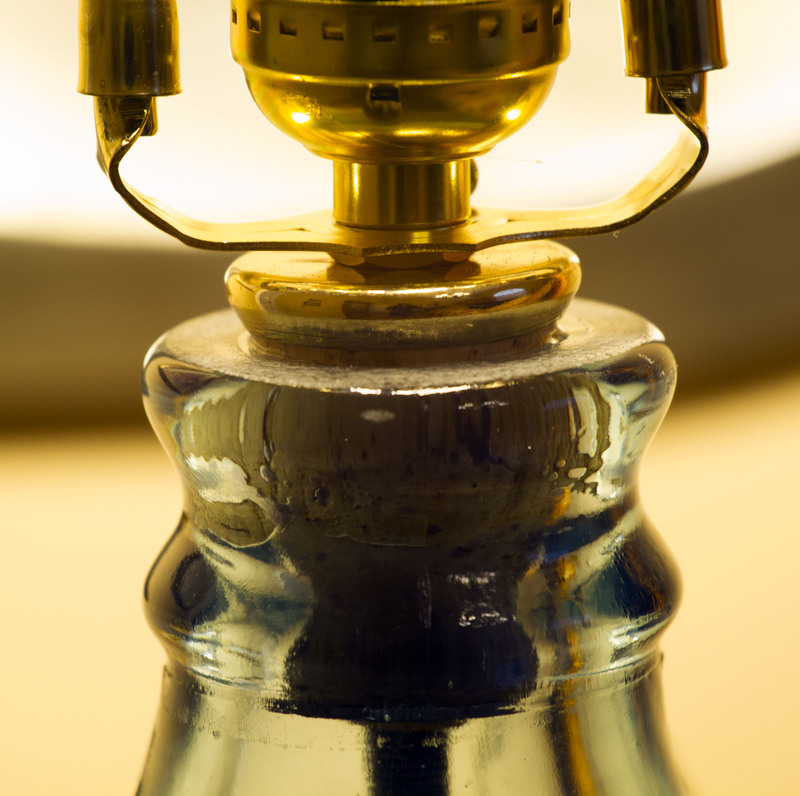 A hole was drilled in the original cork for the lamp fittings to go through. Instructions are simple and included with lamp kits. 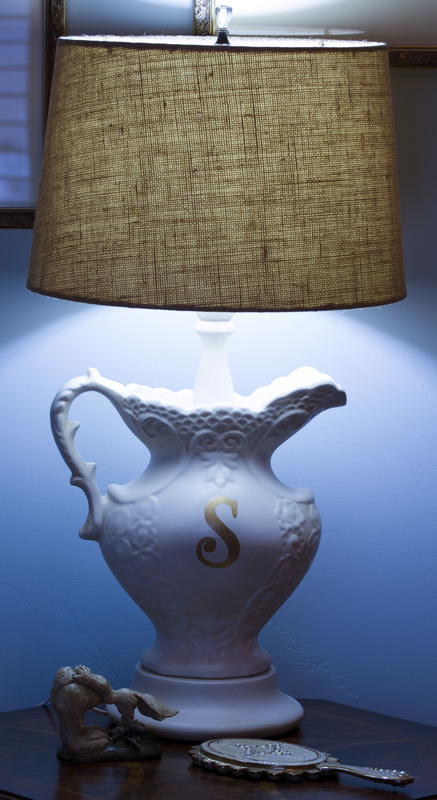 The shade was recovered by using spray adhesive on burlap and rolling the shade on glued fabric. After making sure it was smooth I trimmed the edges about a half inch longer and glued the edges under the rims of the shade. I used ribbon to glue over the edges to finish the inside of the shade. I also pick up lamps at garage sales and thrift stores that need dressed up. I rewire the lamps for safety and use paint to fix scratches, etc. Some of my favorite lamps are the “found” lamps that now have a good home. 19 Feb	This entry was published on February 19, 2014 at 3:37 pm. It’s filed under DIY, Re-purpose, Re-purpose Gallery and tagged DIY, lamp shades, lamps, Painting, re-purpose, recovering lamp shades, rewiring lamps, up-cycle, water bottle lamp. Bookmark the permalink. Follow any comments here with the RSS feed for this post.